The doctor will ask about your symptoms and medical history. A physical exam will be done. Food allergies are often diagnosed based on your own observations. It is a good idea to keep a diary of your symptoms. Note when the symptoms occur and what you have eaten. You may be asked to go on an elimination diet. This should be done under your doctor’s care. You will not eat a suspected food. If your symptoms decrease or go away, your doctor may be able to make a diagnosis. If you eat the food and your symptoms come back, the diagnosis is confirmed. This is most often only done in cases of skin irritation or atopic dermatitis. The doctor will place a diluted extract of the food on the skin of your forearm or back. The skin is scratched with a small pick or tiny needles. If there is swelling or redness, an allergic reaction may be present. The doctor will make the diagnosis based on the skin test and your history of symptoms. In rare cases, skin tests can have a severe allergic reaction. This test should only be used under the supervision of a physician or other trained medical personnel. 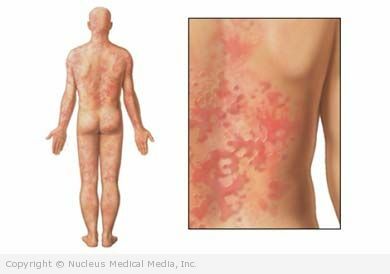 Severe eczema may make this test hard to interpret. The doctor may order blood tests (RAST or ELISA). These tests measure the level of food-specific IgE in the blood. IgE is a type of protein that the body produces when it comes in contact with something to which it is allergic. The presence of IgE in the blood may indicate an allergy but is not enough to make a diagnosis. Avoid foods and food ingredients that cause you to have an allergic reaction. If you think you’ve eaten something to which you are allergic, and you have difficulty breathing, call for emergency medical help. If you are diagnosed with a food allergy, follow your doctor’s instructions. Consider seeing an allergist (a doctor who specializes in diagnosing and treating allergies). Be aware the food may become contaminated by shared utensils, containers, and during preparation.